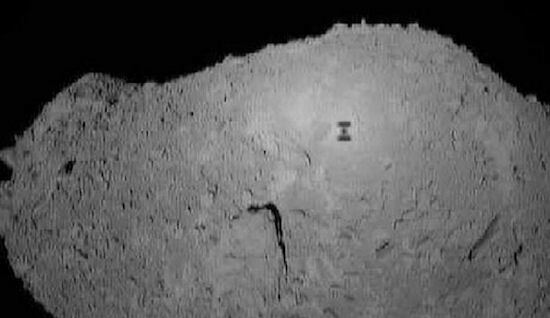 Dec. 29, 2010: The Japanese Aerospace Exploration Agency's Hayabusa spacecraft has brought home to Earth tiny pieces of an alien world–asteroid Itokawa. He has good reason to be excited. Asteroids formed at the dawn of our solar system, so studying these samples can teach us how it formed and evolved. Hayabusa launched in 2003 and set out on a billion kilometer voyage to Itokawa, arriving a little over two years later. In 2005, the spacecraft performed a spectacular feat -- landed on the asteroid's surface(1). The hope was to capture samples from the alien world. But there was a problem. The projectiles set to blast up dust from the surface failed to fire, leaving only the particles kicked up from landing for collection. Did any asteroid dust made it into the collection chamber? The return of Hayabusa went exactly according to plan, according to JAXA: full story. Zolensky and other eager scientists, with eyes riveted skyward, watched the answer plunge back into Earth's atmosphere at 27,000 miles per hour on the night of June 13th, 2010. 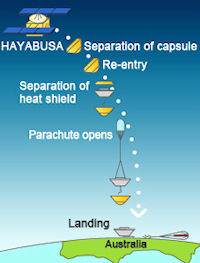 Hayabusa's main bus shattered over the Australian outback during reentry, and the intact sample return capsule drifted to Earth via parachute. "We were mesmerized," says Zolensky. "As we waited for it to land, no one even moved." But the waiting was only just beginning. Because attempting retrieval of the capsule in the dark was too dangerous, he spent a sleepless night before getting a closer look. "I was one of the first people to board the helicopter that flew to the landing site the next morning. And I was the first person to walk up to the capsule." He had to stop within 10 feet of it. More waiting. "I watched the retrieval team recover it. They wore face masks and gloves and blue padded suits. They had to disable the unexploded parachute release charges, and that was pretty nerve wracking. Then they picked up the capsule oh so carefully and placed it in a box." The precious cargo was flown via charter jet to Japan for analysis. Guess who was waiting for it when it arrived? "I was ready to work," says Zolensky, who along with fellow team member Scott Sandford of NASA Ames Research Center had traveled to Japan for the opening. "The first results were disheartening. When we scanned the capsule with a modified CAT scan, there appeared to be nothing inside." Next, Japanese members of the team painstakingly dismantled the capsule, piece by piece. "They had to use a micromanipulator to avoid contamination, and the process took months." "Once we got inside the capsule, we could see dust on the interior walls. I thought to myself, 'we've got asteroid dust here!' But there was still a possibility the contents could be contamination from launch or reentry and landing." The next step was to remove and analyze the particles -- another agonizingly slow process, and more waiting. "The particles are each smaller than the diameter of a human hair. 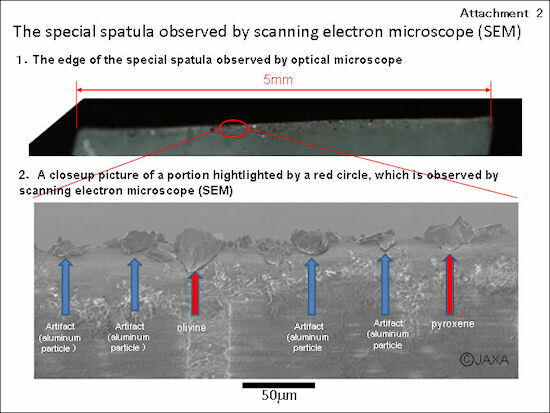 We finally used a Teflon spatula to sweep out a large number of tiny particles." Though most of the particles are still in the capsule, the team has removed and analyzed 2000 of them with an electron microscope. "At least 1500 of them are from the asteroid! We're seeing pieces of another world. It looks like a very primitive type asteroid. We'll tell you more in March at the 2011 Lunar and Planetary Science Conference in Houston." This is only the third time ever that samples of a solid extraterrestrial body have been brought back to Earth. The Apollo astronauts and Soviet Luna robots were first – they brought us samples of moondust. And NASA's Stardust spacecraft returned samples of comet Wild 2 in 2006. "The Japanese people are thrilled, and so are we. The emperor even requested a personal tour of the capsule. This is their Apollo mission. They're showing us all a new world!" (1) This is only the second time an asteroid landing has been achieved. The only other time in history a spacecraft landed on an asteroid's surface was when NASA’s Near Earth Asteroid Rendezvous-Shoemaker spacecraft landed on asteroid Eros in February 2001.